Figure 8 Fisher glycosylation route 2,3,5-tri-O-benzoyl-a-D-arabinofuranoside (25). Figure 9 Synthesis of commonly employed D-arabinofuranosyl donors. 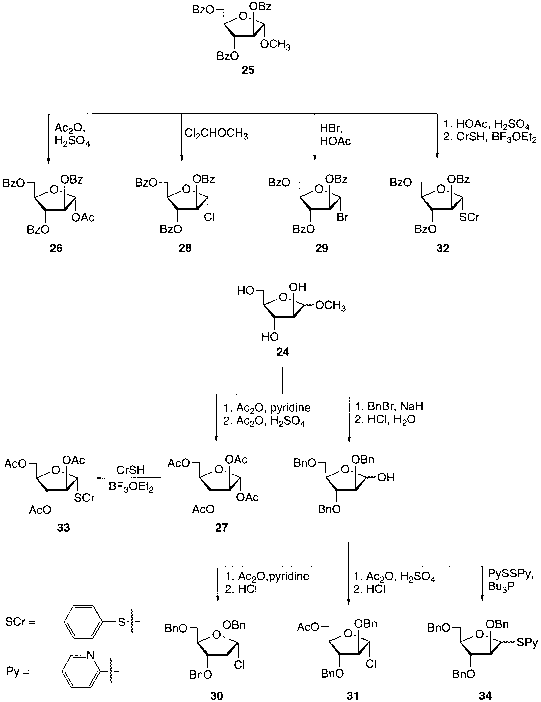 Figure 10 Synthesis of |8-galactofuranosides from acylic S,0-sugar acetals. Ozonolysis of 3,4,6-tri-O-acetyl D-glucal (40), followed by reductive workup with dimethyl sulfide, affords the formyl aldehyde 41. The formate ester can be selectively cleaved in the presence of the acetates by refluxing in acidic methanol yielding the reducing sugar 42. Attempts to use 42 directly in glycosylation reactions via in situ activation of the anomeric hydroxyl group [81,82] failed, but this derivative could be converted in two steps and excellent yield to thioglycoside 33 . Protected D-glucal derivatives are readily available, and consequently this methodology is an attractive alternative to more conventional routes to arabinofu-ranosides. In particular, the conversion of fully 13C-labeled glucose to labeled ara-binose oligosaccharides by this route has been demonstrated . For the synthesis of 13C-labeled oligoarabinosides, this method is preferable to a strategy involving Fisher glycosylation of labeled D-arabinose because the cost of the starting material (13C-labeled D-glucose) is fourfold cheaper, while the overall yields of the transformations are similar.